This entry was posted on January 31, 2017 by Woven Monkey. 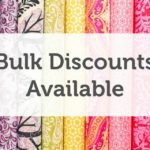 Did you know there are bulk discounts available? If you're looking to purchase 20 metres you can claim 15% off our standard price, and for 50 metres a fantastic 20% off! What's more your order can consist of multiple designs and fabrics. The only requirement is the purchase must be at least 20 metres in total. We've also made claiming your discount even easier. Rather than issuing you with a code, the discount is now automatically given at the basket page on the site. Hello, I'd like to make a pair of curtains 90" x90" for my lounge to match a feature wall pattern. The curtains don't have to be lined as it's just to close in front of a bay window that has vertical blinds anyway but just makes the room cosier with curtains pulled across. I've been looking for material in same pattern as my wallpaper but cannot find it anywhere. If I send you a picture would you be able to quote me a price to have fabric made in same pattern please? Thanks.